The evidence so far seems to make it clear that the lion was illegally and brutishly killed by American, Dr. Walter J. Palmer. Palmer has been labeled a "coward and a killer." PETA said that Palmer should "hang for killing Cecil." Palmer has had protesters swamp his home and his office. (Palmer's a dentist.) Some protesters dressed as "dentist hunters." Echoing much of the media's shock and outrage over this incident Jimmy Kimmel choked up on-air as he described Palmer's actions. Death threats have sent Palmer into hiding. Contrast our culture's response to Cecil the lion with the response to the organization ran by Cecile Richards. The gruesome videos--which, again, should surprise no one--that recently shed more light into the nasty business of Planned Parenthood--killing children in the womb--have not garnered nearly the outrage as has the death of a lion. As Rush Limbough asked today, "[H]ow in the world can you get teary-eyed and misty-eyed and sad over Cecil and, at the same time, participate in burying what's happening at Planned Parenthood (PP)?" As a piece I will have out shortly notes, the indifference that many have shown PP reveal how devoted so many Americans are to the perverse sexual agenda of today's left. Additionally, in a lame attempt to link the death of Cecil the lion to conservatives and republicans, a headline at The Hill.com today declares, "Cecil the lion's killer donated to Romney." The piece is very short and reveals nothing new about the incident other than the fact that Dr. Palmer donated $5,000 to Mitt Romney in 2012, and $250 to GOP representative Jim Ramstad in 1990 and 1992. PP, the recipient of billions of dollars in federal tax-payer funds, has donated tens-of-millions of dollars to political campaigns, almost all of which goes to democrats (and I would argue, 100% has gone to liberals). For example, in 2014 PP donated $588,918 to a PAC for federal candidates. $586,095 went to democrats. $2,823 went to republicans. That's 99.52% for democrats and 0.48% for republicans. Have you heard any of this in the media? What does it say about us and the media that a single dead lion generates so much sadness and anger, yet so many of us seemingly couldn't care less about the death of tens-of-millions of children in the womb? So tell me (in the comments below), by what are you more offended? Led by General Washington, time and again the rag-tag American forces went up against the world’s most elite army and snatched victory from the jaws of defeat. From Trenton to Princeton, Saratoga, Valley Forge, and on and on until Yorktown, American forces defied the odds, and the “invisible hand” to which Washington referred was always there. There were far too many “coincidences” that benefited the Colonial Army—at least for those who experienced or witnessed such events—for things to be written off simply as good fortune. Of course, that is exactly what many modern historians do. Thus, for example, most Americans have never heard "the rest of the story” when it comes to the largest battle of the entire Revolutionary War. The Battle of Long Island, the first major battle after the signing of the Declaration of Independence, was a victory for the British. However, the escape by the Americans was one of the most significant military achievements by the Colonial Army. 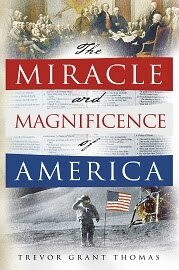 It is also one of the greatest examples of divine intervention in American history. Just prior to the American Declaration of Independence, in early June of 1776, the British began sending troop ships down from Canada with intention of taking New York. The British ships dropped anchor just off Staten Island. Over the period of the next several weeks and months the British had amassed a force of nearly 32,000 troops on Staten Island. With a force of about 19,000, Washington was unsure whether the British would invade at Long Island or Manhattan. Thus, he chose to divide his forces. Beginning early in the morning on August 22, 1776, thousands of British troops launched from Staten Island and in the matter of a few hours landed on Long Island. Though Colonials were stationed on the shore, the British landing went unopposed. The Colonial forces, consisting of Colonel Edward Hand’s Pennsylvanian Riflemen, retreated and by noon there were about 15,000 Red Coats on the shores of Long Island. Three days later the Red Coats were reinforced by nearly 5,000 Hessians. Being misinformed of the British numbers, and thinking that perhaps the Long Island landing by the British was a ruse, Washington left his forces divided between Manhattan and Long Island. When the fighting on Long Island commenced on August 27, the Colonial forces numbered only about half the British and Hessian force that totaled nearly 20,000. The fighting raged throughout the day, and soon the American forces were surrounded or overwhelmed. Two American regiments led by General William Alexander—known as Lord Stirling because of his Scottish ancestry—consisting of the 1st Delaware and the 1st Maryland Infantry, became cut off and trapped. Stirling ordered his forces to retreat behind the fortified American position on Brooklyn Heights. A contingent of several hundred Maryland troops, known today as the Maryland 400 (which may have been only about 250), remained behind to protect the retreat. They battled British forces that were 10 times their number. Led by Stirling and a young major named Mordecai Gist, they fought ferociously and heroically. Several times (maybe as many as six), the Maryland 400 charged the British lines. They held the British off long enough for their comrades to reach safety. All but a handful would be killed or captured. Washington, observing the battle, remarked, “Good God, what brave fellows I must this day lose!” If not for such bravery, Washington would have lost his army that day. Surrounded, hopelessly outnumbered, and with the East River behind them, Washington and his army waited for what was surely to be the final British assault that would finish off the trapped Americans. All afternoon of the 27th they waited. Dusk turned to dark and inexplicably the British forces, led by General William Howe, a distinguished and capable commander, defied all military logic and held their ground. By the morning of the 28th, overcast skies moved in. By the late afternoon, rain began to fall. The British were settling in, digging trenches, and hoping for an American surrender. In addition to severely outnumbering the Americans, a significant contingent of the Royal Navy, led by General Howe’s brother, Admiral Richard Howe, waited at the mouth of the East river ready to sail in and rain cannon fire upon the trapped colonials. However, the winds accompanying the storm that moved in kept the British ships safely away. As the night of the 28th came, General Howe continued to wait. All the waiting gave Washington time to develop a plan. It was desperate, and it was not popular among his senior officers. Washington had decided to evacuate his entire force of nearly 9,000 using small boats that he obtained from General William Heath who was stationed between Manhattan and what is now the Bronx. The task was enormous and fraught with peril. At their current position, the East River was a mile wide. To be successful, the Americans needed stealth, time, deception, and wind to keep the Royal Navy away. By “chance” the last troops to reinforce Washington’s position were Colonel John Glover’s “Marvelous Men from Marblehead.” This company of 1,200 men was disciplined and well trained. They were also mostly seamen and fishermen. This meant that they were expert oarsmen and well capable of quietly rowing the necessary distance across the East River. During the night, the storm moved out and there was no rain to help drown out the noise of the withdrawal. Silence was ordered. Additionally, some forces had to remain in place to keep the British deceived. One unit of such men, led by Colonel Edward Hand, mistakenly received orders to head for the shore. This left a gap in the American line that the British could have easily exploited. However, it went unnoticed by the Red Coats and, catching the error, Washington sent Hand’s men back into place. The fog remained until the last Colonial left Long Island. It then lifted and the stunned British rushed to the river and began firing at the fleeing Americans, but it was too late. They were out of range and safely away. Virtually all Colonials who kept a diary of those events noted the fog and, like Tallmadge, gave credit where it was due. Nearly 9,000 Americans were evacuated with no loss of life or limb. According to witnesses, Washington was the last man to leave Brooklyn. Had Washington and the large American contingent on Long Island been captured, it likely would have ended the war. However, "providential aid" prevailed. The miraculous fog, the dawdling and seemingly blind British, the timely arrival of skilled oarsmen, and a helpful northeast wind that kept British ships out of the East River—these were too many “coincidences” to give credit to mere chance. Though technically the British were the victors in the Battle of Long Island—when the news reached London there was tremendous celebration—the Americans could not deny that the “invisible hand” of the “Almighty Being” was clearly present on Long Island and had delivered them from what looked like certain defeat.